OBSOLETE: The site and app have been down for years. Update: StackCenter has been completely rewritten to use Soapi.JS2. I have also made some changes to the UI. StackCenter is a website designed to make keeping track of all your accounts easier. Simply enter your username from one of the sites and you're good to go! You can then view your personal page that lists recent comments to you, overall reputation, etc. all on one page. As a new feature, I added a global reputation graph for the last 30 days so you can see how you're doing. The application uses stack.PHP on the server and Soapi.js2 on the client side. Of course jQuery and flot are used as well. 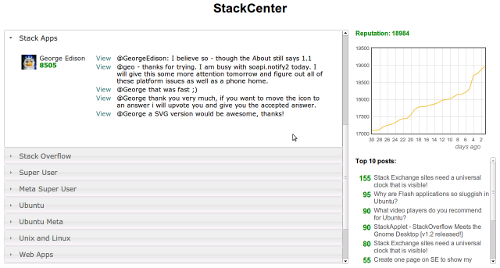 StackCenter gives me my overall rep, as well as rep and comments per site. But it doesn't give me a dashboard of all my recent question votes, answer votes, and comments. I'd like to see my "recent" view more or less with the existing layout -- because it works well, and the "summary" and other detail tabs are useful -- but one view that contains all the sites I participate in. Imagine this following screenshot, which contains not just SU but all sites as source (and possibly top-15 instead of top-5). Now that would be really useful. Wow, this is a great dashboard, exactly what I was looking for. I'm thrilled that it includes all the sites that are linked to my Google Account, not just the usual suspects SU/SO/SF. Yay! On WinXP+IE7 at work, Loading recent comments... and Loading reputation graph... is displayed but then neither the comments nor the graph(s?) are displayed, just empty space instead. Might be a firewall or other local issue? On my iPhone 3G (iOS 3.1.3, not iOS4 with HTML5), the comments and graphs also don't show but instead a red text "Error retrieving data." This is on cell data, not on wifi, if that makes any difference. I find the idea of StackCenter quite interesting, however I have a few modifications to suggest. I would prefer to have one "tab" for each site. Is content for a site updated automatically ? I don't have a clue about it. Not the answer you're looking for? Browse other questions tagged app website obsolete soapi.js stack.php . How to get notified when any of the content I have edited or posted is edited, deleted, or closed?